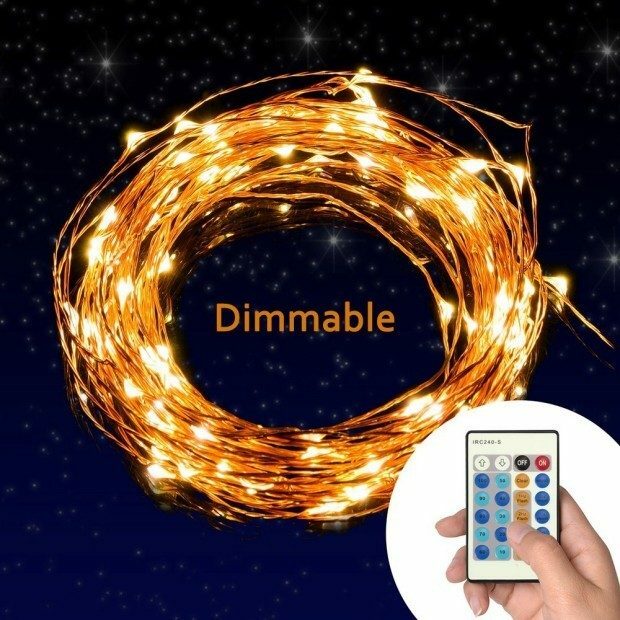 Dimmable Copper Wire LED Starry String Lights Just $19.99! Down From $70! You are here: Home / Great Deals / Amazon Deals / Dimmable Copper Wire LED Starry String Lights Just $19.99! Down From $70! Head over to Amazon and order the Dimmable Copper Wire LED Starry String Lights Just $19.99! Get FREE shipping if you are a Prime member or on orders of $35+! Best Seller of STRING LIGHTS on Amazon, more than 5 million satisfied customers and growing, 12 months warranty + 6 month extended after registration, and 24/7 customer support. Our convenient multi-function remote controller lets you control the light remotely with 10 brightness levels. Also includes 3 different modes for adjustable settings: flash / strobe / fade. 2700-2900K warm white-yellow Mini Led Lights are bright enough to illuminate any dark corner, or create a romantic setting. These light are perfect for spicing-up your décor or setting the mood for a party. Great for use in a restaurant or small business. Cost effective and energy efficient, the Starry Lights will not overheat after prolonged usage. They are safe to touch even after 14 hours of usage. The low profile power adapter is easily hidden and is guaranteed with both UL certification. Comes with a 5 foot adapter cord and 33 feet of lighting wire with 100 individual LEDs.